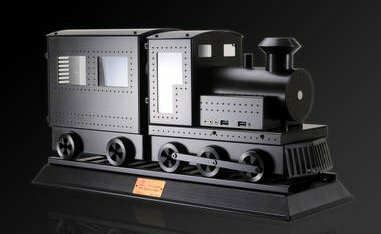 Lian Li will show off several innovative cases at Computex 2012; including the steam engine train shaped CK-101 and the the SUV-like PC-Q15. Interestingly, both cases can move and the CK-101 even has smoke coming out of its exhaust. Lian-Li Industrial Co., Ltd. will be attending Computex Taipei 2012 from June 5 to June 9, 2012 in Taipei, Taiwan. Lian Li invites and welcomes all distributors, system integrators, media, and technology enthusiasts to visit their booth (#J1009a at Nangang Exhibition Hall 1F) and get a hands-on preview of the new line before they enter the market later this year. Additionally, the SUV-esque PC-Q15 adds an automotive touch to Lian Li's theme this year. This PC-Q15, which is specially designed for Computex, will be driving around in loops at Lian Li's booth. Come see for yourself these crowd-gathering moving chassis. A chassis designed for extreme noise reduction that has no visible vents, and only has a carefully calculated sized intake vent underneath the chassis. See and Touch All Models In addition to these highlighted products Lian Li will be displaying their full line of mini, mid, and full tower elegant brushed aluminum chassis with the high quality build and features that are to be expected from Lian Li. Lancool's Latest Steel Chassis Constructed with steel rather than aluminum, Lancool's chassis will be on display at Lian Li's booth. Come see for yourself these more mainstream-level steel chassis manufactured by Lian Li. Custom OEM Manufacturing Requests Welcome With 20 years of manufacturing experience for both system integrators and OEM/ODM clients, Lian Li is proud to be the only manufacturer in Taiwan able to provide quality aluminum workmanship and design. A rich history of cooperating with several of the world's top system integrators gives Lian Li the edge when it comes to understanding the needs of OEM/ODM and SI customers. Lian Li's renowned craftsmanship can deliver customers' special requirements with quick and professional results.